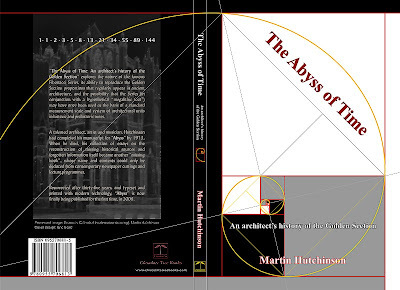 Last year I did some typesetting for a 1970's book by Martin Hutchinson, on archaeology and the Fibonacci Series. A couple of things stuck in my head that I hadn't come across before. One was the idea that the ribbed stonework of North-European Gothic cathedrals might have been inspired by the ribbing in Northern European longboats. The other was that the Fibonacci Series may once have been used as the basis of an international prehistoric system of weights and measures (which kinda overlaps with Alexander Thom's work on the existence of a possible standardised "megalithic yard"). At first sight, this second idea looks a bit anachronistic ... surely the Fibonacci Series is a comparatively recent invention, with perhaps a few obscure older precedents in ancient texts, and could only have been of interest to a very limited number of people in ancient times? Well, if you think of the Fibonacci Series as a mathematical thing, sure ... but if you've ever worked on a delicatessen stall, it should strike you that actually, the qualities of the Fibonacci Series make it an ideal system for quickly measuring out and bagging standardised quantities of food and other measurables, if your customers (or staff!) aren't especially numerate. If you've ever used an old-style kitchen counterweight balance with weights that go up in powers of two, then you'll already be used to the idea of using binary for a weights and measures system. The binary system lets you measure out any integer quantity of something, but it's a bit fiddly. If you run a busy market stall, you don't want to be carefully measuring out whatever weights a customer might ask for. You want a simple set of pre-packaged sizes. The binary series is the first member of a family of additive systems that form an Extended Fibionacci Series. But as a trader, we don't want to be only supplying our product in quantities that are powers of two - that's not customer friendly. We want a system that does 1, 2, 3 ... and then has units where each step is somewhere in the vicinity on one-and-a-half times the previous size. And that's where the next member of our Extended Fibonacci Series comes in. This second member of the family is the usual Fibonacci Series. It's the basis of an ideal weights-and-measures system for people who can't multiply or divide, and maybe don't even have a strong grasp of number. You can present them with a set of pre-set sizes that you can name, that can be created by stacking rods or blocks together, and the simplicity of the system means that they can easily check for themselves that you aren't cheating them. All they have to do is learn and recognise how the units stack together. Traditional pre-metric weights and measures (such as the old Imperial system) tended to be based on multiples of threes and fours and sixes and twelves, with a few fives and tens thrown in for good measure. There seems to be a strong influence here from ancient Sumerian mathematics, with its emphasis on base-60 (which allows a large number of convenient integer divisions with integer results). The Sumerians get credited with the decision to use a factor of 360 for the number of degrees in a circle, and for using sixty divisions for minutes into degrees (measuring angles) or minutes into hours (measuring time). But one of the odd features of many pre-metric (ie non-decimal) systems was the appearance of "thirteen" in some of the definitions of units. Thirteen has no right to exist in any multiplicative system of weights and measures. It's a prime number! And it's so close to twelve (which divides so nicely into 2, 3, 4 and 6), that there's no obvious reason why we'd want to use multiples of thirteen in a system instead of multiples of twelve. Except that twelve doesn't appear in the Fibonacci Series, and thirteen does. So all those thirteens in the old archaic weights and measures systems might be leftovers from a more primitive tradition of weighing and measuring, where people created larger sizes by clumping one each of the two smaller sizes together. They might have been the last echoes of an old pre-Sumerian tradition. 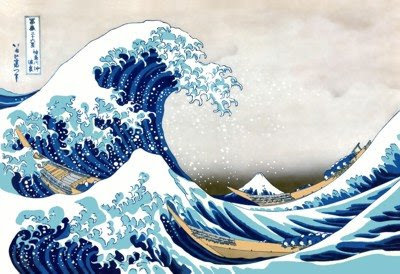 Habits and traditions are sometimes passed down through human societies long after the original meanings have been lost, as a kind of behavioural fossil. If Hutchinson's hypothesis is correct, this may be one of the oldest. Some economics commentators have recently been getting worked up over why it is that the clever people who work at major financial institutions somehow always seem to end up creating boom-bust cycles. They don't have to pay those bonuses back when there's a crash. One of the foundations of Twentieth Century relativity theory was the idea that Einstein's early "special-case" theory of relativity ("Special Relativity", or "SR") had to appear as a complete subset of any larger and more sophisticated models. At first glance, this seemed unavoidable. Einstein's later and more sophisticated general theory was at its heart a geometrical theory of curved spacetime... it described gravitational fields in terms of how they warp lightbeam geometry, and then used the principle of equivalence to argue that the effects associated with accelerations and rotations must also follow the same set of rules. We could then model all three classes of effect as an exercise in curved-spacetime geometry, and go on to extend the model to include more sophisticated gravitomagnetic effects. But Einstein's general theory didn't attempt to apply these new curvature principles to simpler problems involving basic relative motion, because his earlier special theory had already dealt with those cases by assuming flat spacetime. Instead of going over the same ground a second time, Einstein simply said that, just as classically-curved surfaces reduced over sufficiently small regions to apparent flatness, so the geometry and physics of general relativity, if we zoomed in sufficiently far, ought to reduce to flat spacetime and the "flat-spacetime" version of physics described by the special theory. ... It's true that if we zoom in on a GR-type model sufficiently far, we end up with effectively-flat spacetime, but this doesn't automatically mean that we then have flat-spacetime physics. It might instead mean that we've zoomed in so far that there's no longer any meaningful classical physics to be had. We have to accept at least the logical possibility that real physical particles (and their interactions) might be unavoidably associated with spacetime curvature, and in that scenario, we can't derive their relationships by presuming absolutely flat spacetime, because that condition would only be met if our particles didn't physically exist. Allow any form of velocity-dependent curvature at all around moving particles, and SR's flat-spacetime derivations fracture and fail. This is especially unfortunate since the experimental evidence suggests that moving particles do seem to disturb the surrounding lightbeam geometry, just as we'd expect if curvature effects were a fundamental part of physics, and if the flat-spacetime basis of special relativity was wrong. This suggestion that "all physics is curvature" was put forward at the end of the Nineteenth Century by a mathematician called William Kingdon Clifford, who's usually remembered for having his name on Clifford Algebra. The critical thing about a "Cliffordian" model in this context is that when we implement the principle of relativity within it, we find that the resulting physics doesn't reduce to special relativity and the relationships of Minkowski spacetime. Instead of a Minkowski metric, it reduces in the presence of moving particles to something that looks more like a relativistic acoustic metric, and which appears to be much more compatible with quantum mechanics than our current classical models. So the perfect, unbreakable geometrical proofs of SR's inevitability as physics aren't complete. In order to complete them, we have to be able to show that Cliffordian models can't work ... and that seems to be difficult, because the results of taking a Cliffordian approach seem to be pretty damned good. 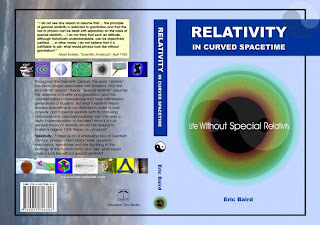 To date, nobody seems to have been able to come up with a convincing disproof of this class of curvature-based solution, and until that happens we have to accept the possibility that special relativity might not be a part of our final system of physics. There were a few issues that didn't get sorted (or spotted) before "Relativity in Curved Spacetime" went to press. I'd really wanted to track down the old textbook reference that I'd had for the electromagnetic analogue of of Mach's Principle, applied to rotation. If you place an electron inside a hollow charged sphere, the field cancels, and the electron doesn't "see" the background field. But if you then spin the charged sphere, the electron is supposed to feel a radial force acting at right angles to the rotation axis, and also a sideways dragging force, analogous to the outward and sideways forces that matter feels when the mass of the outside universe is spun around it (blamed on apparent "centrifugal" and "Corioilis" fields experienced within the rotating frame). Didn't manage to find the reference in time. But the entry was accidentally deleted and the "rebuttal paper" comment ended up attached to the following "Schiff" reference. This got corrected in the hardback edition. There were also a handful of minor typesetting mistakes (typically missing or misplaced "s"-es) in the first half of the book that snuck past the spell-checker, but nothing serious. Those have been corrected for the hardback. And as far as I know, that's it. I probably didn't have to zoom in quite so far to demonstrate the thing, but I thought, what the hell, let's just leave the Eee Box running until the zoom calculations hit the 32-bit floating-point limit. The zoom doubles in size every second, and does that for about 47 seconds. At some point there'll be a web page to go with this, but it's not quite finished yet.